The Rookie on ABC: Cancelled or Renewed for Season Two? Does John Nolan have staying power? Has The Rookie TV show been cancelled or renewed for a second season on ABC? The television vulture is watching all the latest cancellation and renewal news, so this page is the place to track the status of The Rookie, season two. Bookmark it, or subscribe for the latest updates. Remember, the television vulture is watching your shows. Are you? An ABC comedy-drama, The Rookie stars Nathan Fillion, Alyssa Diaz, Richard T. Jones, Titus Makin, Mercedes Mason, Melissa O’Neil, Afton Williamson, and Eric Winter. 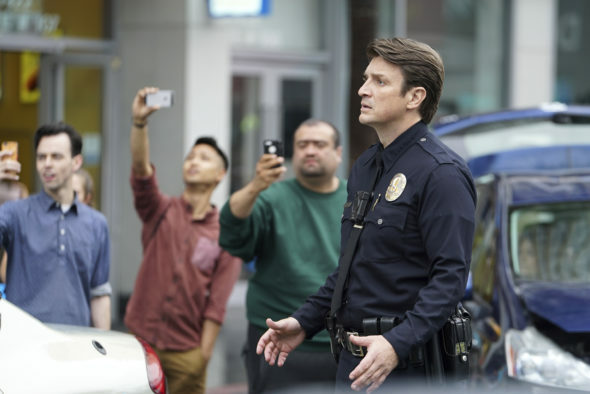 The story centers on John Nolan (Fillion), a small-town guy who, after a life-changing experience, decides to pursue his dream of being an LAPD officer. Now he’s the oldest rookie on the force, and the brass thinks he’s just having a midlife crisis. He’s got to keep up with his younger co-workers (not to mention young criminals) or he’ll risk lives. Maybe though, he can use the experience he’s gained with age, and the determination he has developed over the years, to make a real go of it. Either way, he’s got a secret weapon — his sense of humor. The first season of The Rookie averaged a 0.73 rating in the 18-49 demographic and 4.17 million viewers. Find out how The Rookie stacks up against other ABC TV shows. As of April 19, 2019, The Rookie has not been cancelled or renewed for a second season. Stay tuned for further updates. Will ABC cancel or renew The Rookie for season two? The ratings haven’t been very good but I suspect the network will give this series every chance to succeed. My guess is that it will be cancelled but ABC could renew it and make some changes to try to improve the ratings. I’ll update this page with breaking developments. Subscribe for free alerts on The Rookie cancellation or renewal news. TV show ratings are still important. Follow The Rookie‘s weekly ups and downs. Check the rankings for all of ABC’s TV shows. Find more of The Rookie TV series news or other ABC TV show news. Explore the ABC status page and other TV show status pages. What do you think? Do you hope The Rookie TV show will be renewed for a second season? How would you feel if ABC cancelled this TV series, instead? Match Game: Is the ABC Game Show: Cancelled or Renewed for Season Five? Single Parents: Is the ABC TV Series Cancelled or Renewed for Season Two? Schooled: Is the ABC TV Series Cancelled or Renewed for Season Two? The Fix: Is the ABC TV Series Cancelled or Renewed for Season Two? 20/20: Is the ABC TV Series Cancelled or Renewed for Season 42? Child Support: Cancelled or Renewed for Season Three on ABC? Take Two: Is the ABC TV Series Cancelled or Renewed for Season Two? Castaways: Is the ABC TV Show Cancelled or Renewed for Season Two? The Proposal: Is the ABC TV Series Cancelled or Renewed for Season Two? The Last Defense: Is the ABC TV Series Cancelled or Renewed for Season Two? American Housewife: Is the ABC TV Series Cancelled or Renewed for Season Three? 20/20: Is the ABC TV Show Cancelled or Renewed for Season 41? What Would You Do? Cancelled or Renewed for Season 14 on ABC? Battle of the Network Stars: Cancelled or Renewed for Season Two on ABC? Downward Dog: Cancelled or Renewed for Season Two on ABC? Dancing with the Stars: Cancelled or Renewed for Season 24 on ABC? great show. Look forward to watching it each and every week. This show gets better with each episode. We love this show and hope it gets renewed for another season.